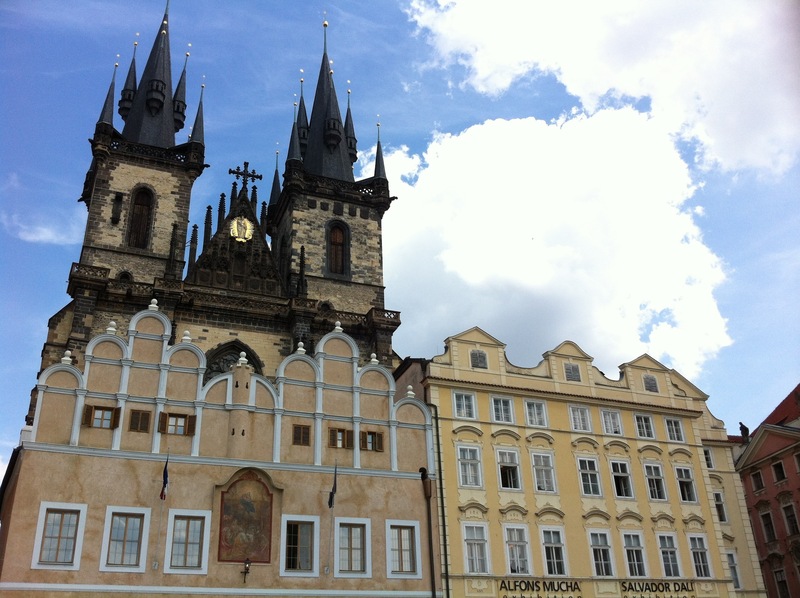 If Prague weren’t as beautiful as it is, this would be a totally depressing post. 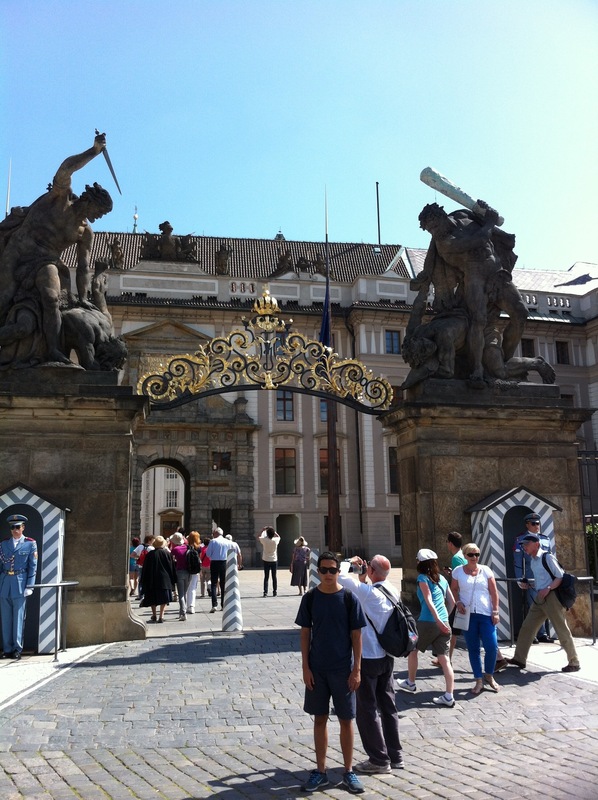 The Czechs did their very best to get us to hate Prague and they almost succeded. 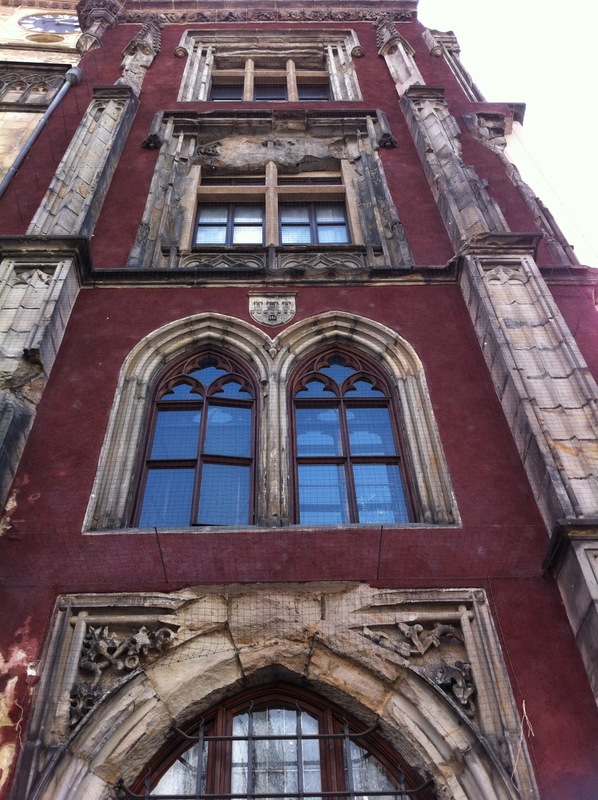 We had taken an overnight train from Krakow which was as restful as a heavy metal concert. We arrived disoriented and without a place to call home. We got help from the tourist info office who reserved a room for us, charged a fee, told us to get on the tram (don’t worry about the ticket, only one stop she said) and assured us the hotel would accept credit cards. As we were getting on the tram, some guy pushed us in and barely made it before the doors closed. One stop and we got out, he followed us. Suddenly he started yelling at us (in Czech of course) demanding to see our tickets. We didn’t have any, that was our first mistake. He claimed to be an “official ticket inspector” and demanded we pay a fine on the spot. When we asked him to identify himself, he flashed a tiny badge for about a second before hiding it again all while looking around to make sure no one else saw it. We tried to explain to him that we were told not to get a ticket by the tourist info woman but he kept foaming. A second armoire-sized guy had joined him by now and they had us cornered. They demanded to see ID. They truly took us by surprise and we handed our passports over, second big mistake. We had prepared for something like this happening in Russia (never did), and had copies of our passports ready to hand over instead, but in the moment we didn’t even remember those. The thugs then demanded an inordinate amount of money. We had been in Prague all of 20 minutes, we didn’t even have cash on us. They “graciously” offered to accompany us to an ATM. As we were walking there, I popped into a store and frantically tried to get help. A man finally stopped to listen, when I asked him if this was normal procedure he said no, when he gets caught without a ticket, he gets a fine which is NEVER paid in cash on the street. I asked him to come with me but he was reluctant claiming he was late. By now, the thugs had noticed I was missing and began screaming at Fernando about it. The man and I arrived and he asked to see their badges. They refused and began screaming at him so badly he got his cellphone out and called the police. Needless to say, the thugs weren’t happy and told us that there would be “BIG trouble”. They yelled at the man some more and he left telling me that the police would be coming. It was obvious that this wasn’t the first time these thugs had done something like this since they now began threatening us with even “bigger trouble” if we contacted the embassy, something that hadn’t even ocurred to us. To cut this story short, the police did not come and we had to fork over almost two hundred dollars in order to get our passports back. Money which the thugs quickly divided between them before getting back on the tram right behind a group of three backpackers. I hoped those kids had tickets! We’ve gone over this a lot trying to figure out what we could have done differently. Getting tickets regardless of what the tourist info lady said is obviously the first thing. Second, we shouldn’t have taken our passports out but would the copies have sufficed to appease the beasts? We simply don’t know. We finally get to the hotel and discover they don’t accept credit cards when the receptionist screams at us that he told the tourist info lady this just this morning. Like we’re supposed to know that. We were still shell-shocked and only stared at him until he finished his tirade. We didn’t have much left over from the “fine” and the ATM won’t give us cash until 24hrs later so he finally agrees to take partial payment and get the rest later but not before he yelled at us some more. I was ready to get back on a train headed anywhere away from Prague. We took the Metro to the Town Square and made sure to get tickets this time. In less than one hour, we were stopped FOUR different times by “official ticket inspectors” all screaming, all demanding to see our tickets. There were tons of people on the Metro but the only ones that got stopped every time were us. Talk about profiling! 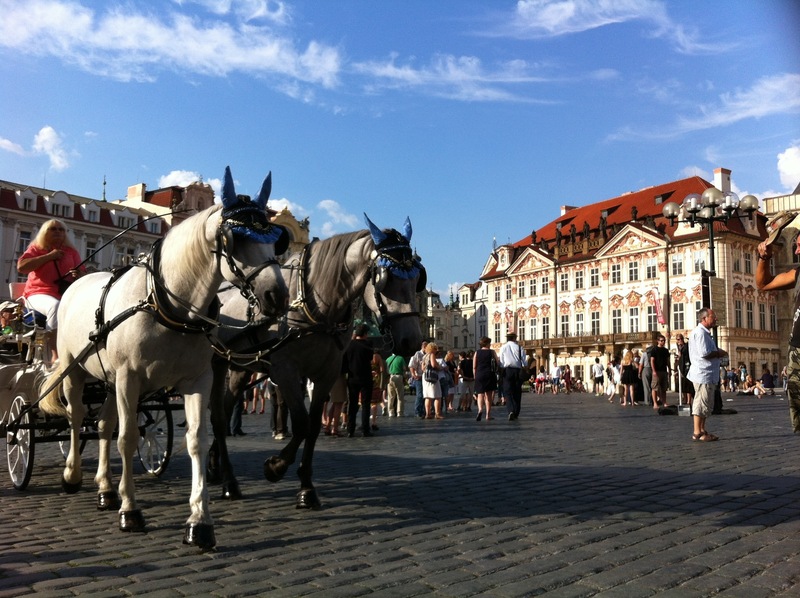 While riding without a ticket is a civil infraction, corruption and intimidation must be crimes even in Prague methinks; but then again “Tourists are here to be fleeced” seems to be Prague’s motto. Don’t think it was just some thugs on the tram that put us off Prague, the gelato lady cursed at us when we attempted to put the napkins she had previously given us in the trash bag, our would-be guide in Prague interrupted the tour to curse at some guy who first cursed at him (we left the tour). We observed the police in the street harassing people. The drivers of horse-drawn carridges would plunge right into crowds of people without a thought for moms pushing strollers or old ladies who couldn’t jump out of the way fast enough. 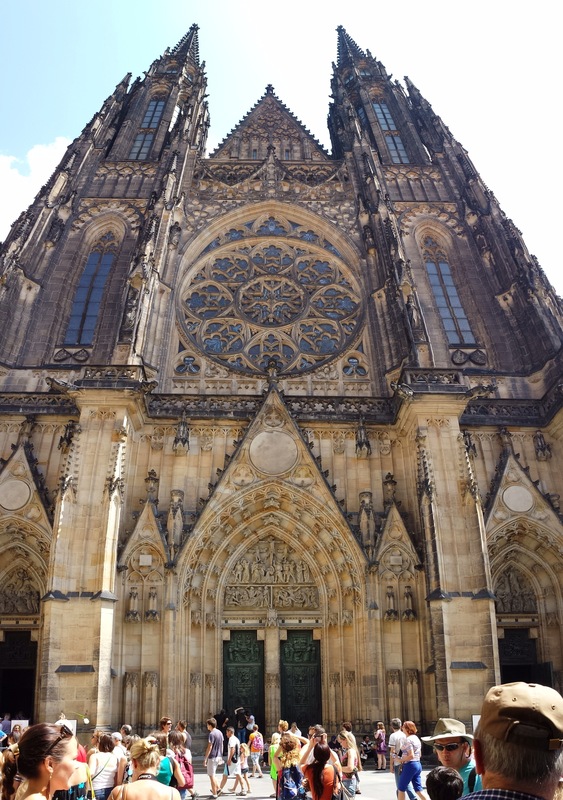 Throw in the hoards of drunk backpackers, even drunker Czechs begging or doing tricks on street corners and you’ll get the picture. Not to mention the dozens of homeless, and high, bums catching and torturing pigeons in full view of the police who couldn’t care less. I swear we tried to keep a positive outlook but it was so bad that after a while Fernando(son) said “People here are as bad as Bolivia”. He took the words right out of my thoughts. 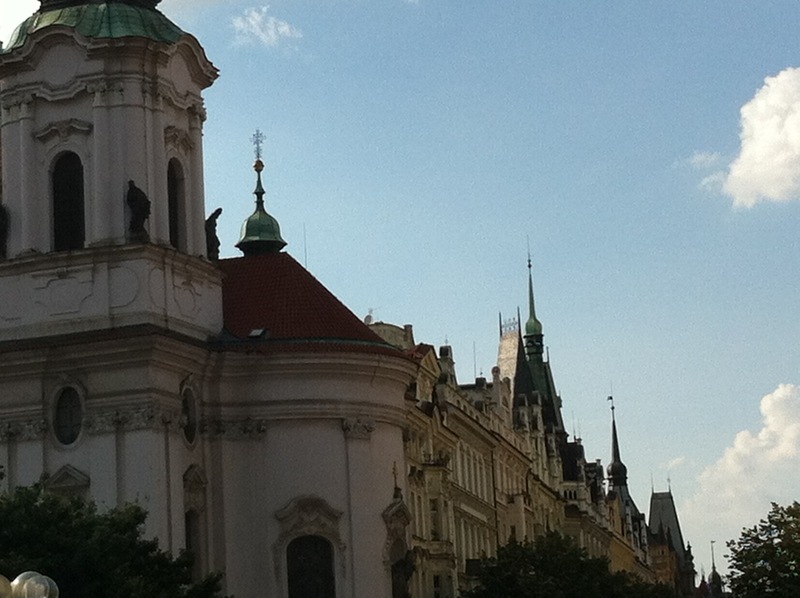 Good thing Prague is pretty because it doesn’t have anything else going for it. When it all gets to be too much, you can always look up and breathe. The city is actually given the nickname of “The City of a Thousand Needles” because of its numerous spires. This was all done on purpose as Charles IV designated it as his imperial capital and wanted citizens to always be looking heavenward. I guess even back then they knew Czechs had to be reminded to be good. 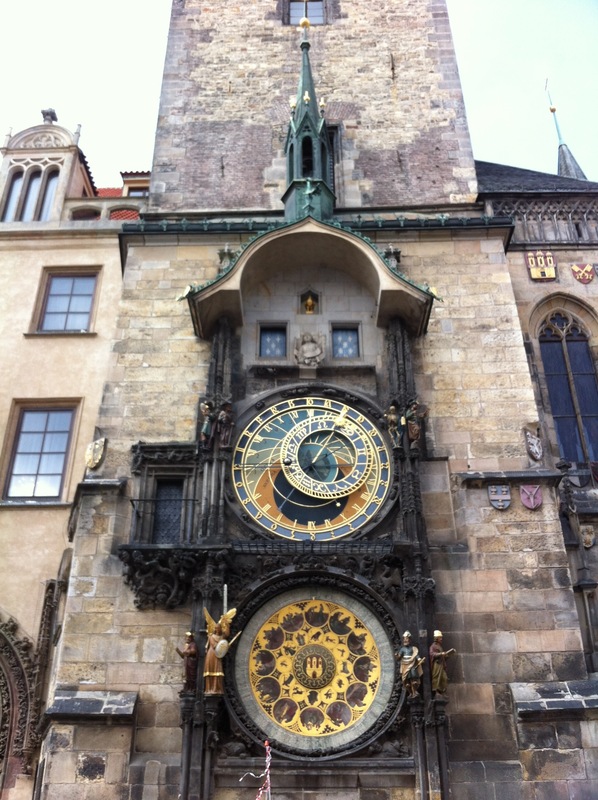 On a corner of the square sits the “Astronomical Clock” which has been working since the 16th century, although it can’t be pushed forward an hour in the Summer and thus is off until the Fall. Every hour, the apostles walk by the windows while death rings the bell. The square is overpopulated with souvenir shops, Thai massage parlors and fish pedicures. 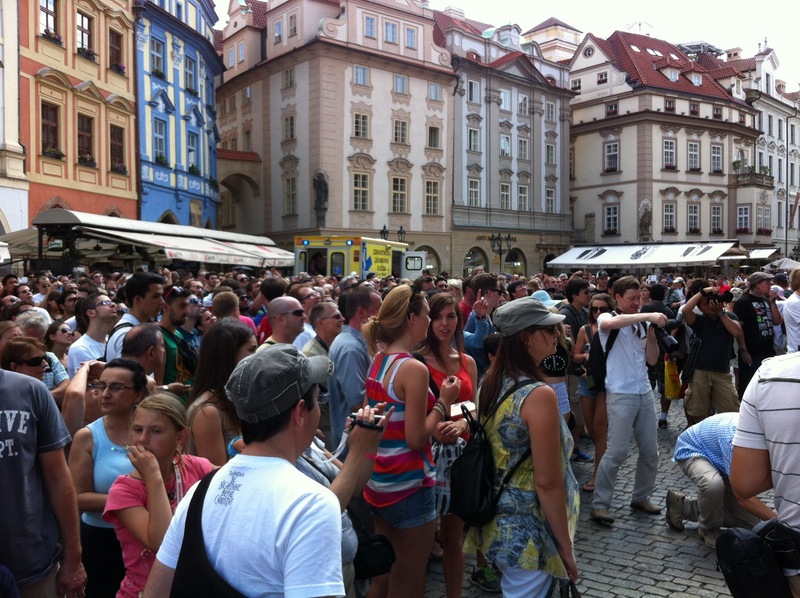 The crowds in Prague get overwhelming. More than half of this crowd is made up of drunk backpackers who stumble around pretending to pay attention to the buildings. The feel is like one of those out-of-control Spring Break videos. 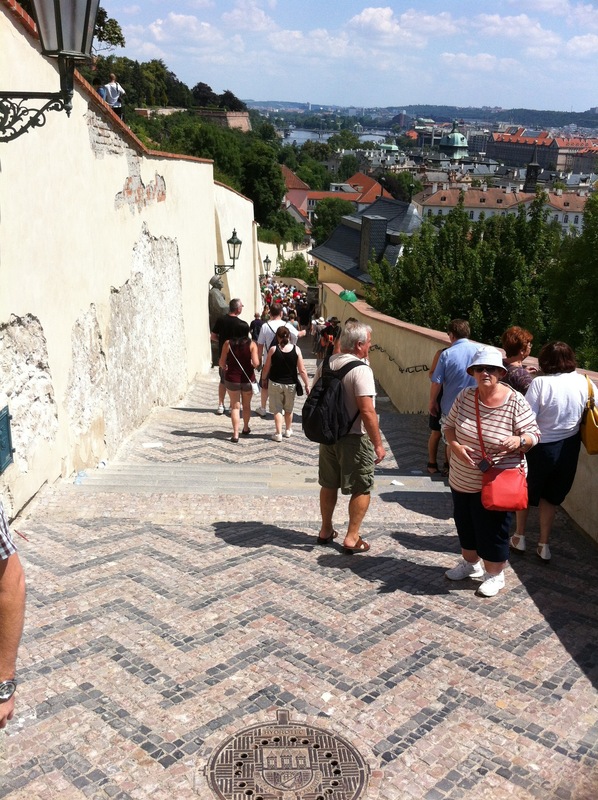 If you want to visit Prague, wait until Fall when all these kids must be back in school. leading up to the Castle Complex. 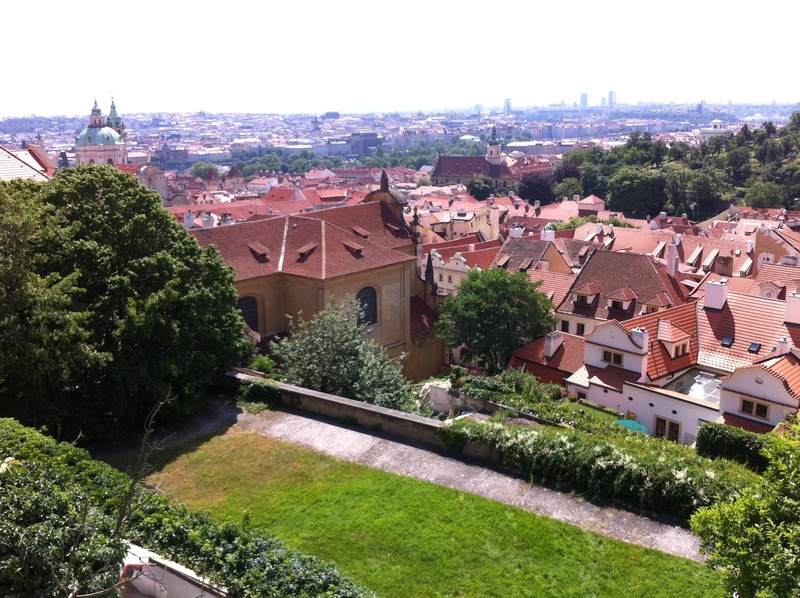 The view of Prague is great from here. 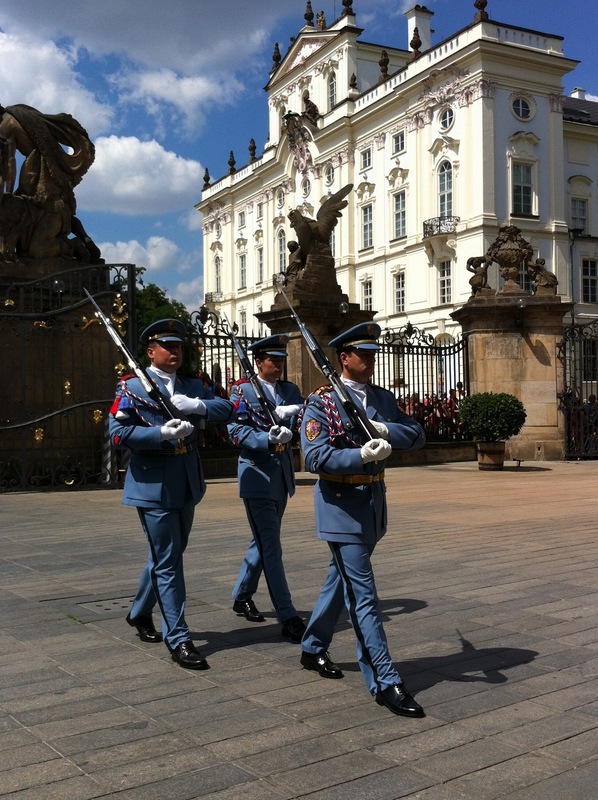 and were able to witness the changing of the guard with the band playing. The Castle is pretty but the true highlight of the visit is St. Vitius Cathedral. 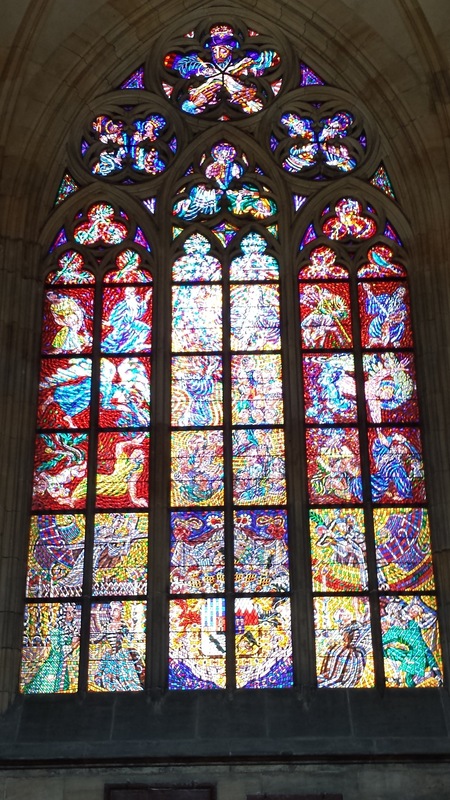 Prague is beautiful and thus we can not hate it but the two days we spent here were enough to give me new prejudices against Czech people. Although, if it’s something I acquiered AFTER interacting with them, it can’t be a PREjudice, can it? 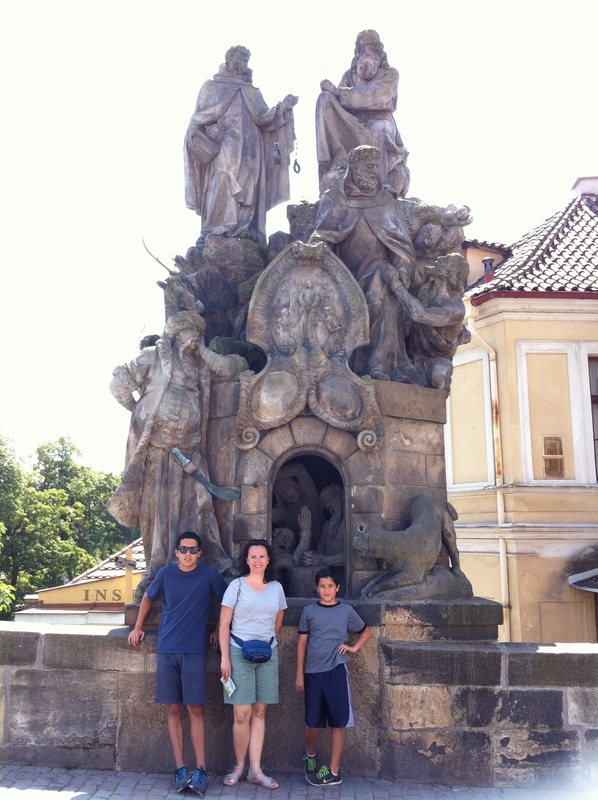 I’m glad we came to Prague, mostly because I can cross it off the list as I can’t imagine wanting to come back. P.S. As if to make sure we didn’t hold on to any ilusions about Prague as we left; the crowd at the train station got so rowdy, the anti-riot police had to be called in, helmets & shields ready. And has this changed your mind about doing normal vacations with hotels and 5 star restaurants with much alcohol?? I am glad Bolivia left the last position. Is a relief.